1-9 Pairs: 34.95 each pair 10-24 Pairs: 18.95 each pair 25-49 Pairs: 19.95 each pair 50-99 Pairs: 14.95 each pair SIZES (A) M3-4 W5-6 (E) M8-9 W10-11 (B) M5-6 W7-8 (F) M9-10 W11-12 (C) M6-7 W8-9 (G) M10-11 (D) M7-8 W9-10 (H) M12-14 You choose the sizes. PRIVATE LABEL:Your Name & Phone Number imprinted on the top (25 minimum) at check out. Duplicate a lab built custom orthotic in less than 10 minutes for the fraction of the cost. Private Label: Your name and number printed on the top (with 25 minimum ordered). 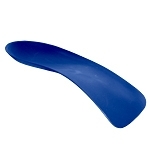 *3/4 semi rigid sport orthotic shell. *Medium profile (Sport Orthotic) to fit in most gym and casual shoes. *1.3 mm thin. *Completely heat moldable and reheat formable. *Heat gun is the only equipment needed to fabricate a custom orthotic. *Usual price range charged is between $140-375. *Proprietary material used to ease of mold. *Patients happy before they leave the office. Take a look at our helpful orthotic molding guide for more information on getting the most out of your orthotics! Fabricate a custom heat mold, direct contact, orthotic in office. 10 minutes you can produce a custom heat mold orthotic, without messy casts or expensive orthotic lab fees. Using these heat moldable orthotics in my hockey skates since last year. Allows me to get better turns and less ankle pain. Brought these heat moldable orthotics for my grand daughter and she has painfree heel spur feet. I am using these heat moldable orthotics in my ski boots and now my ice skates. easy to mold and lasts forever. the price and quality can't be beat. I use them and my patients also been raving on the relief from these orthotics. Easy to make and much cheaper than lab made ones. My partners and I have been using these heat molds for awhile now and the patients, and my staff find them to be very comfortable and benifical. Can't beat the value.